This book is third in a series. If you have not read the previous books, you will probably be very confused.It is very hard for me to decide on a final star rating for this book because I loved some aspects of the story and wasn't so keen on several of the others. Ultimately, I think it balances out to a 3 though I'm still waffling over it.Liked:* Any of the parts with Evy & Wyatt. I love their interactions. I love how Evy is working hard to overcome her psychological barriers to closeness so she can be with him. I almost cried a couple of times from their scenes and it's rare that a romance gets me that emotional. * Evy is a badass and a smartass. Sometimes that can annoy me in a UF heroine because it's become such a trope. However, Evy is so well-written that these things are a natural part of her character. Plus, she backs up her words so it's not just hollow bravado. * The other secondary characters are well-done and interesting in their own right. I would love to read extra stories about Kismet, Phin, etc. 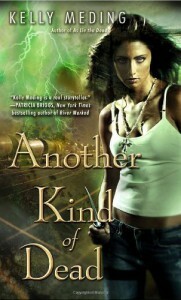 Liked Less:* The action in the book was slower-paced than in previous books. Slower action is fine for me but it also seemed less connected somehow. To me, the events didn't feel tied together into a smooth arc. This is likely because it's the 3rd book in a series but I don't know... it just didn't gel as well as the other books. * The final action sequence and the ending just kind of happened. There was some kind of conclusion but it left so many things up in the air that it didn't make me feel that satisfied glow. It was a mix of cliffhanger and satisfying conclusion that just didn't work for me personally.Overall, Another Kind of Dead was an enjoyable read. I will definitely continue to read the series despite being a little disappointed in some aspects of this installment.